Russia has proposed to Egypt a draft agreement to allow its warplanes to use Egyptian airbases in view of bolstering its military presence in North Africa and the Middle East. Russian Premier Dimitry Medvedev has approved a draft agreement with Egypt for the use of its airstrips and the Rus-sian defense ministry is to work on the conclusion of the deal with its Egyptian counterpart, according to press reports. Under the draft agreement, Russian war jets can land and fly from airbases for a period of 5 years with a possibility of ex-tension. 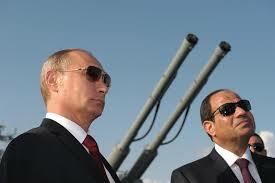 The agreement will also allow Egyptian warplanes to use Rus-sian airbases and fields. Egypt, one of Russia’s major military partners in the world, has signed up for Russian military hardware, including tanks, helicopters and fighter jets. US officials in March reported that Moscow had moved special forces close to Egypt-Libya border in view of supporting Liby-an east-based army commander Khalifa Harfar known as Mos-cow’s protégé in the Libyan crisis. Russia vehemently denied the claims. Posted by KanelkaTagba on Dec 1 2017. Filed under Headlines, World News. You can follow any responses to this entry through the RSS 2.0. Both comments and pings are currently closed.